As distributed commerce continues to blur the lines between in-store and online shopping, creating a consistent and comprehensive experience for your customer regardless of the channel is key to winning every sale. We surveyed more than 250 ecommerce excutives about the challenges they face in the industry. The result was some significant findings on how to move forward. Product content is the tipping point for whether or not consumers buy. 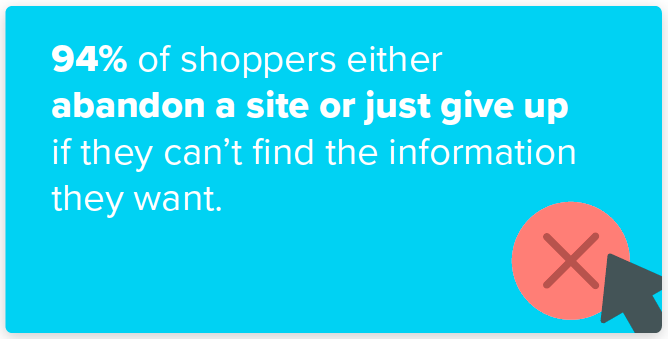 In fact, 94 percent of shoppers either abandon a site or just give up if they can’t find the information they want. Google research found that 87 percent of in-store shoppers look for product information online before visiting a store, 79 percent look while visiting a store, and 35 percent look after visiting a store. Keeping up with consumer demand for content is a daunting task. How are brands and retailers meeting this demand for consistent content? When we surveyed ecommerce executives at brand manufacturers and retailers, we learned the two groups had different challenges. The industry faces a lack of collaboration around managing product content, which leaves room for improvement in quality, customer experience and who knows how much revenue on the table. Retailers rely on consistent and accurate product content to drive business results, and most agree that the combination of optimizing product content across channels and the ability to increase online product assortments has a direct impact on online sales growth. But they can’t do it alone; retailers depend on brands to provide this content, and without a joint effort, success remains out of reach. Brands struggle with the internal product content process - more than half of brands surveyed (55 percent) agree that there is room for improvement. 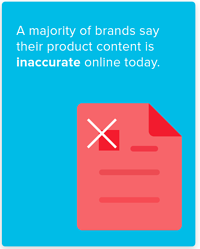 A majority of brands say their product content is inaccurately represented online, an issue that won’t resolve without stronger retailer relationships, yet less than half of brands make this a priority. The hope for collaboration lies in the finding that a majority of brands – 68 percent – say that when given performance data from a retailer, they are willing to dedicate more resources to collaborating and meeting that retailers’ data needs. The bottom line is its going to take some commitment and collaboration on the part of both brands and retailers to build the product content rich experiences that customers want. For more information on how brands and retailers are tackling distributed commerce to meet shopper demands, get the full results of our surevy. Download our ebook: Win the Sale: How Data on How Brands and Retailers are Tackling Distributed Commerce We hope this data helps facilitate the next conversation you have with your retail partners. If your organization is struggling with ecommerce growth and/or digital strategy, you can learn what others in your industry are thinking about these issues.